Technical rating of trail: Lots of very steep walking and scrambling interspersed with off-trail walking and climbing. 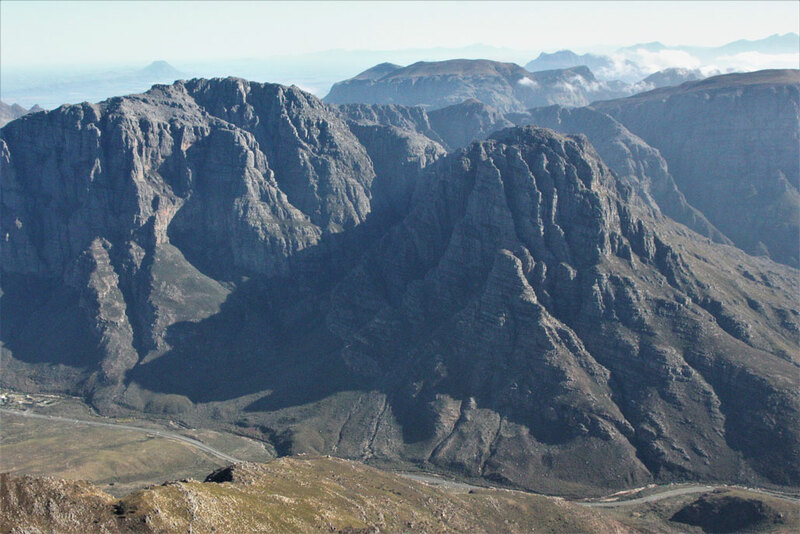 Although I would not consider myself a strict ‘peak bagger’, when I got the chance to attempt one of the Western Cape’s famed peaks – Du Toits Peak, I did not hesitate. 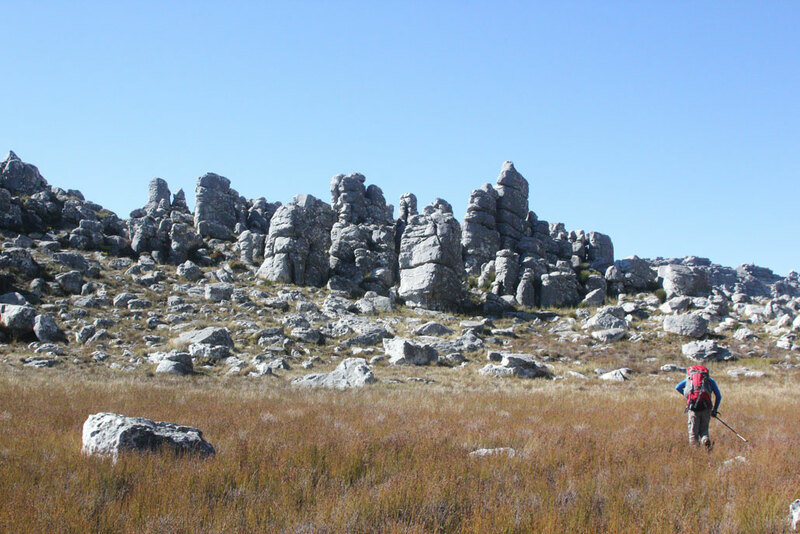 At 1995m, not only is the peak one of the highest points in the Boland mountains, but it is the highest seaward facing mountain in the Cape mountains. My understanding of this is that it is the highest peak visible from the ocean with the naked eye. 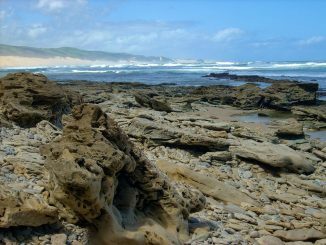 It is also one of two ultra-prominent peaks in South Africa (http://www.peaklist.org/WWlists/ultras/africa.html). 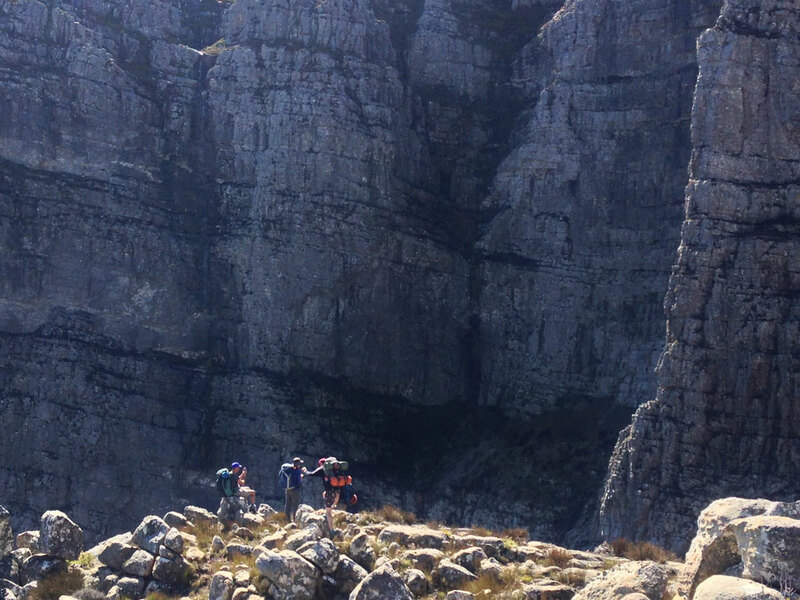 The opportunity was afforded by the Mountain Club of SA (MCSA) Cape Town section who organised the hike. There is no set trail, and the peak can be summited in one day, but makes for a gruelling 11-hour plus endeavour. We did the hike over two days, spending a night near the top. 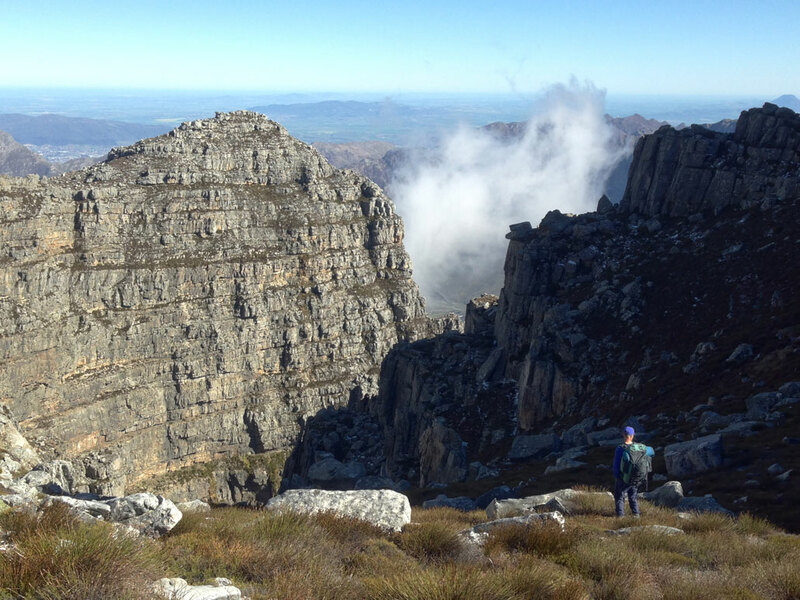 The hike began at the MCSA’s Du Toits Hut just off the N1 highway. From here we made our way to the Fizantakraal road which lead’s through private property towards the Agtertafelberg Hut. 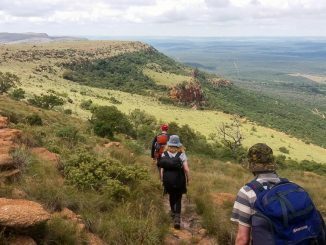 After a few hours trudging along the road, we turned off very near the Agtertafelberg Hut heading east towards what is known as Plum Pudding Ridge. Soon we were completely off any paths and fortunate to be with someone who knew the way. Our route essentially followed the spine of the ridge with some moderate exposure, made worse only by my heavy pack and a very slippery rock section. We stopped at what turned out to be a perfect lunch-stop location. Mountains are big; Humans are small. After just over a kilometre of vertical ascent, at 1480m, we came to a rocky outcrop with a magnificent view of towering rock edifices and couloirs. It is difficult to capture the scale, grandeur and authority of the valley with words or photos. 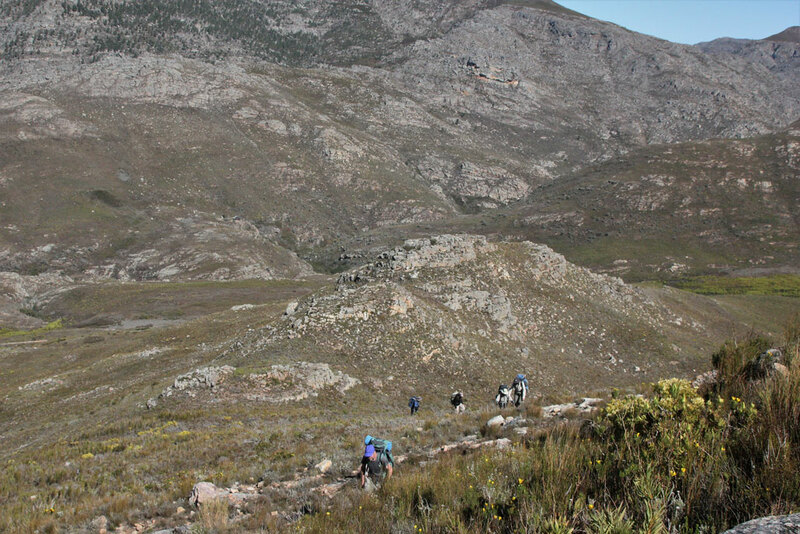 After a satisfying lunch we continued climbing, the route becoming somewhat gentler until we topped onto the grassy ‘vlaktes’ just over 1 700 m. There had been some winter rain and the areas on top were marshy and one had to be wary of sinking one’s foot into the bog, below the yellow vlei grass. Although one can camp anywhere, we decided on a flattish grassy area with crisp water nearby. There are several smaller peaks to explore if there is still gas in the legs. 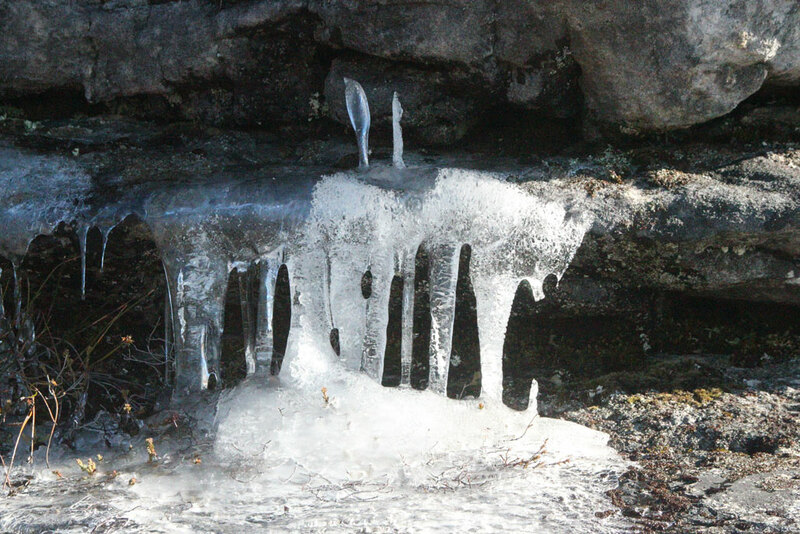 The night had been cold, certainly the coldest I have ever experienced in a tent. 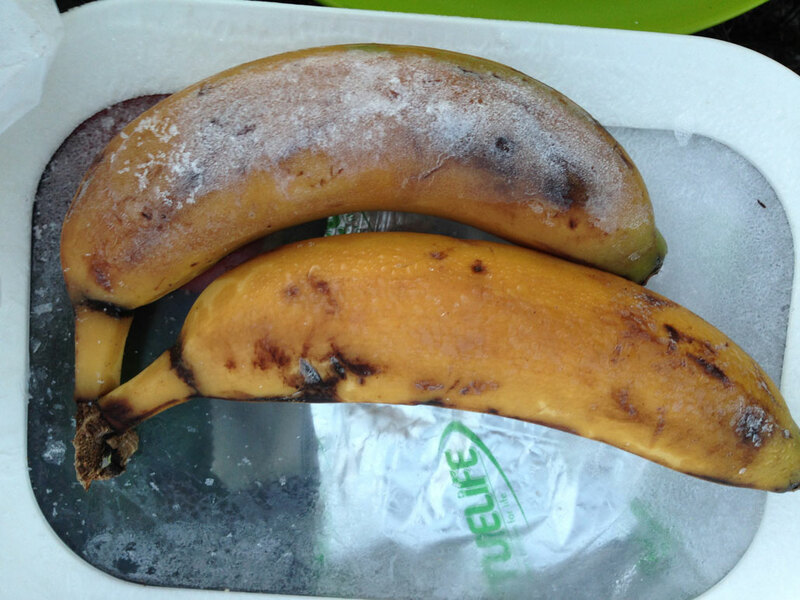 We woke up to frozen ponds, icy bananas that I’d left outside and frost covering the tent. 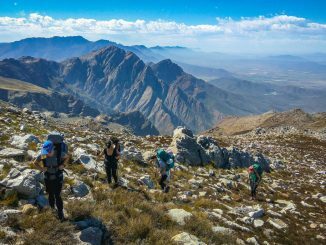 From our campsite we traversed a diagonal route heading north-east towards a small saddle near the summit, and then turning east, giving us not only some much-appreciated sunshine and warmth but also amazing views over the Worcester valley and the Hex River Mountains (Waaihoek etc.). From here we dropped our packs and climbed (precariously with all the snow and ice around) to the summit. There are a few masts and damaged metal items at the top as well as two trig beacons. One of which is Trig 8 – 1994.7m. 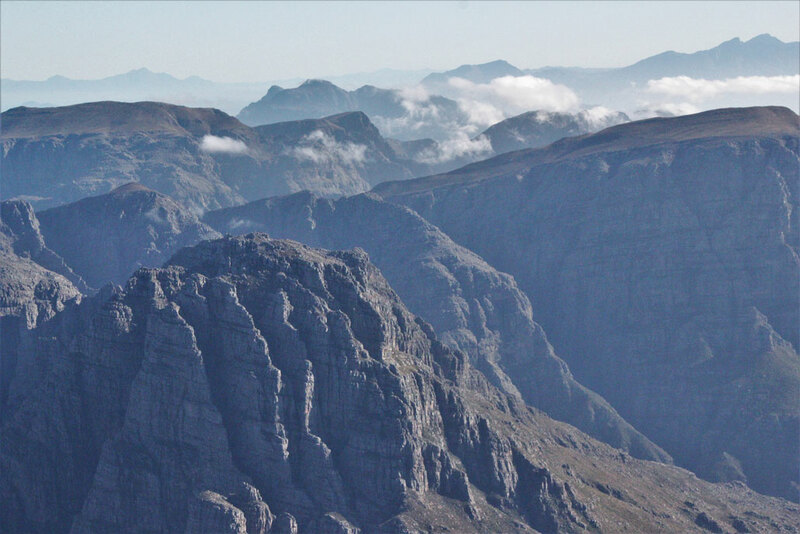 The view here is arguably unparalleled anywhere in the province and must surely be one of the greatest views in the country. 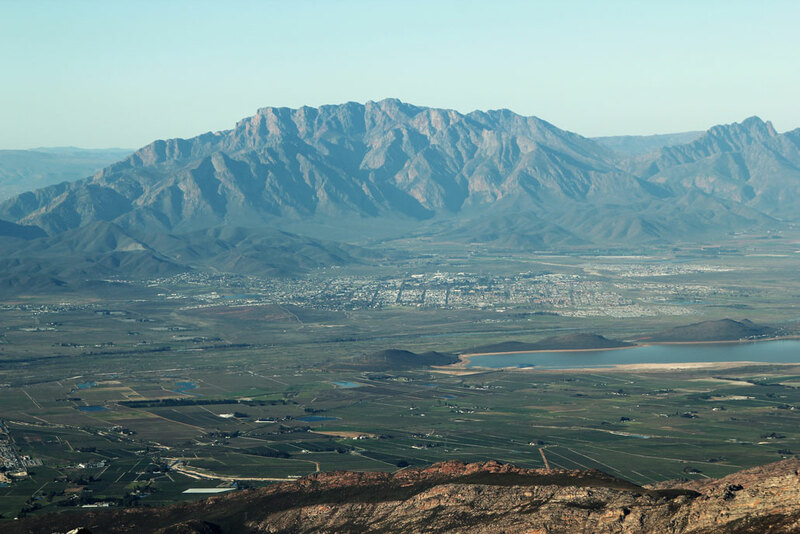 A 360° view of all the surrounding peaks, valleys, towns, dams, topped off with a remarkable if not hairy view down Du Toits’ sheer northern face to the N1 highway below – the trucks and vehicles tiny specs moving across the earth. The route down followed what I understand is ‘Ridges’ and skirts the spine and southern slopes of the ridge visible from the N1. 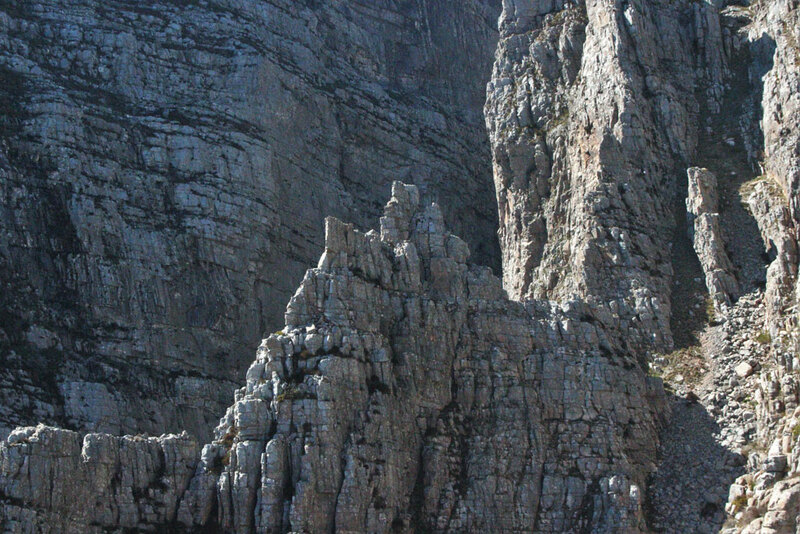 There is some exposure especially near the top and on a rocky scramble further down, however generally the route is merely strenuous. There is evidence of an actual path in parts but this only becomes fully apparent near the bottom on the Elands Pad property where the path joins a gravel track before meeting the Fizantakraal tar road. 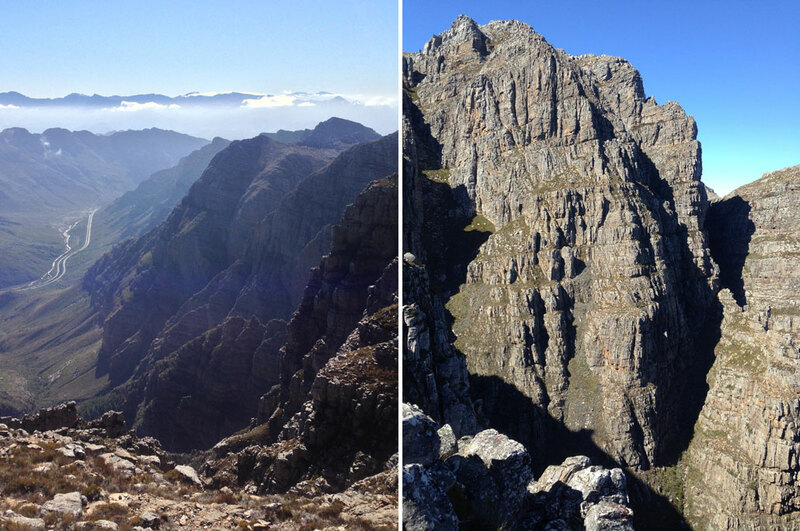 As far as weekend hikes go, it doesn’t get more grand and epic than this! There are unusually very few streams in this valley. 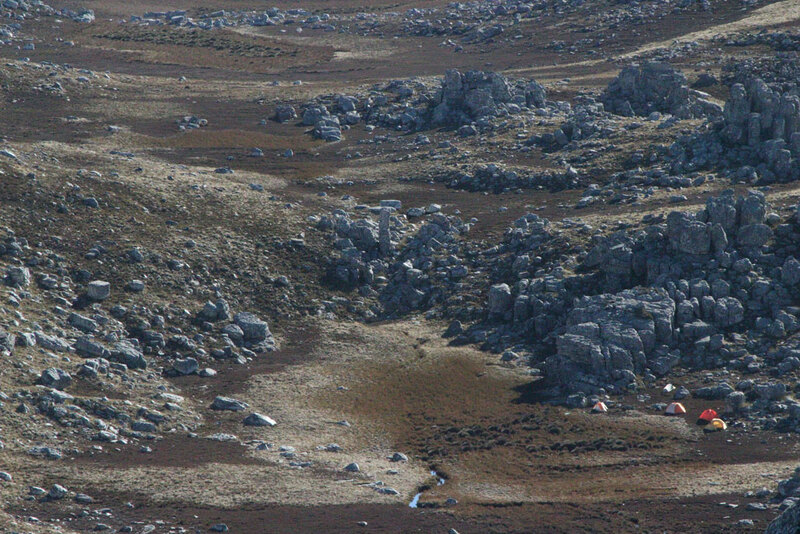 There is one river to access water from on the Fizantakraal Road but very little otherwise, except in the vlaktes near the summit. 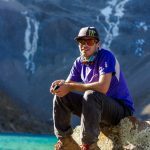 These could be pretty dry in summer months and one should carry plenty of water – making a challenging outing even more difficult. 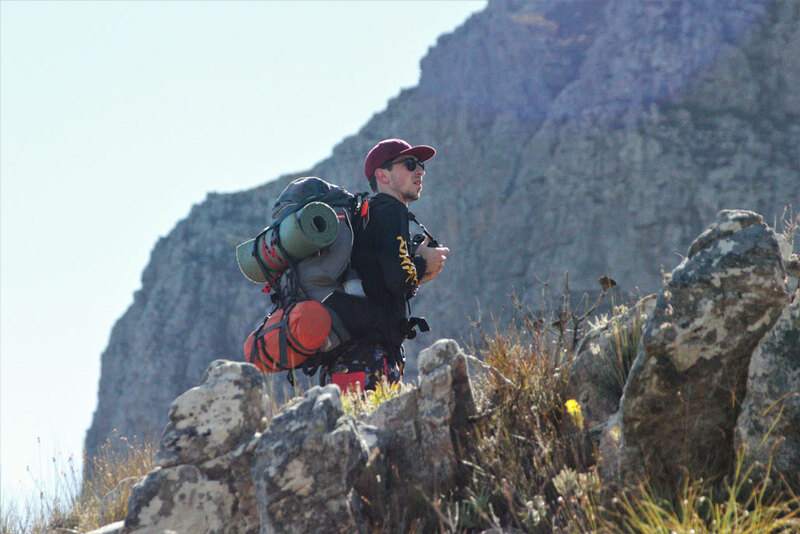 The hike should only be attempted by fit persons who are comfortable carrying a backpack. Additionally, it should only be done with someone who has done the route before and knows the way. 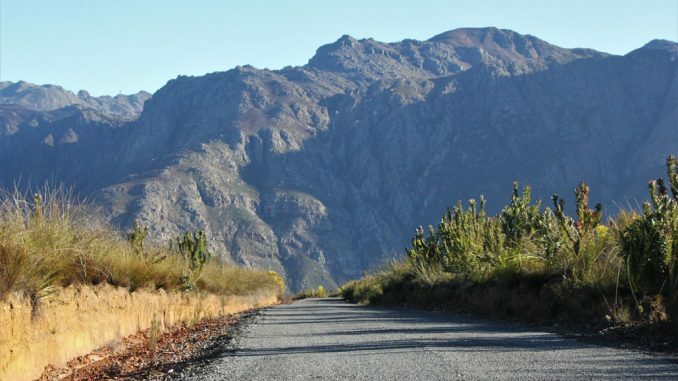 Permits from CapeNature are required (as most of the hike is in the Hawequas Mountain Catchment Area) and permission from the private farm owner to traverse their land. Hi Ruan. Thanks! I can highly recommend it. I’ve never done Arangieskop (I’m still fairly new to the Cape mountains) so unfortunately can’t compare. Very cool write-up and epic pics. Thanks! You’re welcome and thanks for the kind words! So awesome, one for the bucket list – thanks so much for sharing this adventure and your BEAUTIFUL pictures! Breath-taking! Any tips on finding a guide? I cannot verify the quality of any of the above. This was simply a Google search. Your best bet is probably to contact the MCSA (http://www.mcsacapetown.co.za/contact/) and ask if they can post a note saying you’re looking for a guide. Not sure what other options you have. I am currently living in Cape Town. Can get hold of me at jaws.lbw@gmail.com. I went with Peter Hagen. Hi Joshua. Thanks for the write up. This has definately tweaked my interest as something new and adventurous. As you said an EPIC Weekened. Would you by any chance have a GPX file for the route taken?